Good afternoon! First of all, I would like to thank Chancellor Wrighton for having me here again, in the beautiful Washington University in St. Louis. Chancellor Wrighton asked me to give a speech on China-US relations. I became the 10th Consul General of China in Chicago last July. Our consulate covers 9 states in the Midwest, namely Missouri, Minnesota, Wisconsin, Michigan, Iowa, Illinois, Indiana, Kansas and Colorado. I would like to share my thoughts with you on the most important bilateral relationship in the world while revisiting some of my experiences in the last 7 months. Thirty-eight years ago, that is, in July 1979, a delegation of Washington University in St. Louis made up of 20 people visited the ancient capital of Nanjing, China. The deputy head of the delegation was Dr. Stanley Spector, a research expert on China studies. Also serving as the vice chairman of the committee on establishing sister-city relationship between St. Louis and Nanjing, Dr. Spector was entrusted by the Mayor of St. Louis to discuss this matter with Nanjing during this trip. Four months later, St. Louis and Nanjing formed the first sister-city relationship since the establishment of diplomatic ties between China and the United States. St. Louis witnessed the inception of Sino-US friendship and the development of Sino-US relations, and your university also played a crucial role in bringing the two cities together and opening the door to bilateral people-to-people exchanges. Now we are gratified to see that the seed we sowed thirty eight years ago has grown to a leafy and towering tree of bilateral friendship. In 1979, the official exchanges between China and the United States were numbered. Today, the high-level exchanges between China and the United States are close and the dialogue mechanism is smooth. China and the United States have established over 100 inter-governmental dialogue mechanisms, including the strategic dialogue and people-to-people exchange mechanism, the China-US Joint Commission on Commerce and Trade (JCCT) and so on, covering political, economic, security, cultural, science and technology and other fields. So far, there are 47 pairs of friendly provinces-states and 215 pairs of sister cities between China and the US. In 1979, bilateral trade between China and the US was only $ 2.45 billion, and direct investment between them was zero. In 2016, Sino-US bilateral import and export of goods amounted to $ 578.59 billion. China is the third largest export markets and the largest source of import of the United State, and maintains as the largest trading partner of the US. On the other hand, the US has become the largest trading partner, the largest export market and the fourth source of import of China. In 2016, bilateral two-way investment amounted to $ 170 billion, and Chinese companies invested $ 45.6 billion directly in the US, almost doubling that of 2015. The Boeing Company sold one third of its civil airplanes to China, and 22% of America’s cotton and 56% of its soybeans are sold to China. Governor Terry Branstad of Iowa, the nominate of US Ambassador to China told me that China buys more soybeans from Iowa than any other country combined. China is also a huge market for General Motors, Ford, and Chrysler headquartered in Michigan, whose car sales account for 13% of the Chinese market. In 1979, less than 10,000 people in China and the US visited the other country. In 2016, 5 million people from the two countries came across the Pacific Ocean, among which 2.6 million Chinese people visited the United States. Mr. Mark Whitaker, Director of Choose Chicago told us that Chicago has 50 million visitors each year, of which 2 million are from other countries and particularly 200,000 from China. Chinese tourists have become the fastest growing visitors’ group to Chicago with an annual growth rate of 20%. In 2016, 555 Chinese runners competed in the Chicago Marathon, coming right after Mexico as the second largest foreign participating group. In 1979, student from Chinese mainland was hardly seen in any American university. Nowadays, 300,000 Chinese students are studying in universities in the United States, accounting for one third of the America’s foreign students and the largest group of international students. When my relative came to the University of Illinois at Urbana-Champaign in 1991, there were only 30 Chinese students in that university. Last year, when I visited the university, President Timothy Killeen told me that now they have 5,000 Chinese students. I recently visited the laboratory of Professor Fraser Stoddart of Northwestern University, who won the Nobel Prize in Chemistry last year. He told me that 10 out of the 30 students working in his lab were from China. Before winning the Nobel Prize, he has conducted research and teaching cooperation with Tianjin University in China for years. As a crucial component to this relationship, China’s ties with Missouri have also made great headway. China is the third largest trading partner and export market of Missouri. Chinese companies have invested over $ 1.1 billion in Missouri and created 4,500 new jobs. 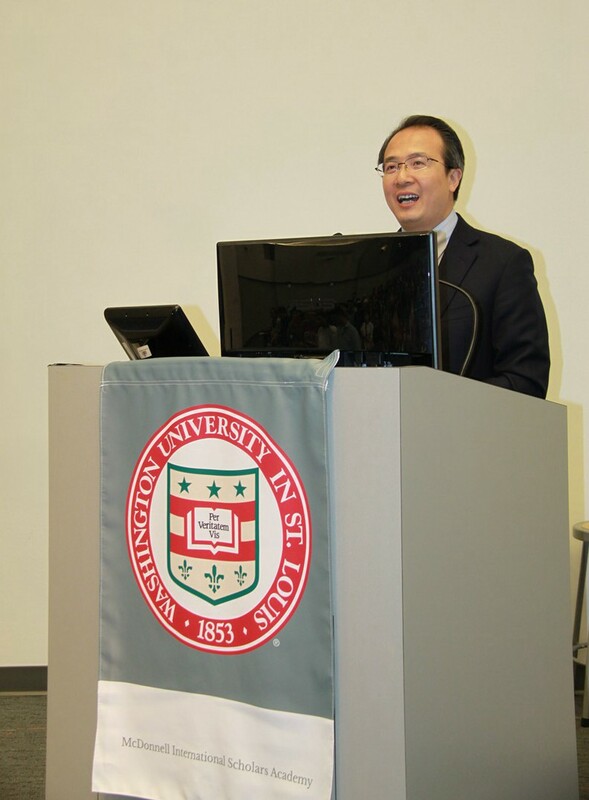 Over 6,000 Chinese students are studying in Missouri, among which over 2,000 students at Washington University here. We can say that the frequent and close interactions on bilateral and multilateral occasions between the leaders of the two countries have built up strategic mutual trust. Sino-US economic and trade relations are highly complementary and interdependent. The exchanges between the two countries in education, tourism and other fields have enhanced mutual understanding between the two peoples and deepened the cultural exchanges and cooperation between China and the United States. Regarding major international and regional affairs, China and the United States have maintained effective coordination and played important roles. This fully shows that the common interests of China and the United States far outweigh the differences. Cooperation between the two countries is conducive to global stability and prosperity, and also in line with the expectations of the two peoples and the international community. As we all know, the US new government took office this year. People who care for China-US relationship are interested in its future direction of development. I believe that four things will remain unchanged regardless how the domestic and international landscape may play out. First, the great common interests of China and the United States have not changed. From trade to investment, from educational exchanges to people-to-people exchanges, from macroeconomic policy coordination to global economic governance, from disease control to disaster prevention, the common interests of China and the United States in bilateral and multilateral fields are expanding. China and the United States have forged a community of shared interests. Second, opportunities brought by the two countries’ development to each other have not changed. China's economy is expected to maintain medium-to-high growth, and its GDP grows by $ 800 billion annually, equivalent to the economy of Indonesia. Mr. Daniel Houston, CEO of the Principal Financial Group based in Des Moines, Iowa told me that China, the US and the rest of the world combined will contribute equally to the world GDP in 2030. The importance of the Chinese market is obvious to all. His company will continue to focus on expanding its business in China. Friends from the Boeing Company told me that China will need 6,810 planes in the next 20 years, and is expected to surpass the US to become the largest aviation market in 2030. According to our anticipation, China's total import in the next five years is expected to reach 8 trillion US dollars, foreign investment 750 billion US dollars, and outbound visits 700 million. All these will bring more opportunities for the world including the US. The United States is also actively upgrading its manufacture, carrying out technological innovation and infrastructure construction and other development strategies. Sound Sino-US economic growth has created vast space of cooperation between the two countries. Third, the expectations of the two countries and the people for steady development of Sino-US relations have not changed. I am deeply touched by the enthusiasm and aspiration of the nine states in the Midwest on cooperating with China. Michigan governor Rick Snyder has visited China for 6 years in a row, making tremendous efforts to facilitate cooperation between Michigan and China and establish friendly state-province relationship with Guangdong Province, which boasts the largest economy among all Chinese provinces. Governor Snyder told me that cooperation with China should become common sense for people in Michigan. Governor Branstad of Iowa met President Xi Jinping, who was then the party secretary of Zhengding County, Hebei Province and on an agricultural observation trip in Iowa, for the first time in 1985. They have become good friends since then. They met again in 2011 in Iowa and felt particularly close to each other. Governor Branstad has visited China many times from then on. He said that Iowa and China have been engaged in mutually beneficial cooperation based on mutual respect and trust and have forged a good partnership. Iowa is ready to have more extensive and practical cooperation with China. Newly-elected Governor Eric Holcomb of Indiana said to me that China is an important partner to Indiana. He attaches great importance to cooperating with China and looks forward to visiting China at an early date and promoting friendly exchanges and cooperation with China. Secretary of Commerce of Kansas Antonio Soave told me that the state government of Kansas opens its arms wide to Chinese investment in Kansas. With a labor force that is well-educated and trained and a low cost of business operation, Kansas is an ideal destination of investment for Chinese companies. Fourth, the international community's expectation that China and the United States can jointly safeguard world peace, development and stability has not changed. China and the United States account for one third of the world's economy, one quarter of the world's population, and one fifth of the world's total trade volume. The world puts much hope in China and the United States to play a constructive role in promoting economic growth, confronting global problems, regional conflicts and hot spot issues. The healthy and stable development of bilateral relations between China and the United States is of great significance to world peace, security, stability and prosperity. It is fair to say that these unchanged elements ensure the certainty of Sino-US relations, that is, China and the United States should choose friendship and cooperation as the future development direction. Two weeks ago, President Xi Jinping and President Trump had an important and successful talk on the phone, reaffirming the importance of Sino-US relations to the two countries and the world. President Trump made it clear that the US government agrees to honor the one China policy, and President Xi Jinping commends this. The two heads of state agreed to maintain close ties, strengthen exchanges and cooperation, and look forward to an early meeting. The important consensus reached by the two heads of state has maintained the political foundation of Sino-US relations, cleared the political obstacles to the development of Sino-US relations, alleviated the concerns and doubts of the international community on Sino-US relations, and provided the necessary conditions for regional and global cooperation in all areas. Last week, Foreign Minister Wang Yi also met with Secretary of State Henry Tillerson for the first time on the sidelines of the 53rd Munich Security Conference in Germany. Foreign Minister Wang Yi pointed out that China and the United States should strengthen communication, enhance mutual trust, manage differences and deepen cooperation following the principles of non-conflict, non-confrontation, mutual respect and win-win cooperation, ensuring greater development of bilateral relations under the Trump administration, more benefits to the peoples and more contribution for the world peace and prosperity. Secretary of State Tillerson said that only friendship can define the relations between China and the US, and the US looks forward to conducting high-level exchanges with China, strengthening cooperation and lifting bilateral relations to a new high. These are inspiring achievements. As the most important bilateral relationship in the world, China-US relations bear on the future of the world and mankind. The choice we make today will have a profound impact on the well-being of the people and the future of the world. The most pressing task is to move bilateral relations beyond the run-in period as soon as possible and ensure greater development under the Trump administration. I would like to offer some thoughts on how to accomplish this task. First of all, we should view each others’ strategic intentions in a right way, respect each others’ core interests and major concerns and handle and manage disputes in a constructive way. China is a peace-loving nation. China has no intention to challenge the United States, and China's development is not to overpower others. Despite of the fact that China's socialist modernization has made remarkable achievements, the fact is that China is still a developing country with large population. China's economy ranks second in the world, but its per capita GDP only ranks 70th with merely 8,000 US dollars because of the 1.3 billion population. China has more than 40 million people living in poverty, more than 70 million living on government allowances, and more than 80 million people with disabilities. Every year we have to create jobs for more than 10 million people newly added to the labor force. There is still a long way to go for China’s development. China's greatest desire is to focus on the development of its own, and improve and ensure people's livelihood. To achieve this goal, China needs to stay in harmony with the rest of the world including the United States and achieve win-win results through cooperation. We should discard the Cold War zero-sum game mentality, as it goes against the trend of China-US relations in the 21st century and is proven to be wrong. The Taiwan question remains the most sensitive and critical part of China-US relationship. It bears on China’s sovereignty and territorial integrity, as well as the national feelings of the Chinese people. We hope that the US can continue to follow the one-China policy and abide by principles in the three joint communiques. China-US cooperation is of great significance to global peace and stability. We should expand cooperation on regional and international affairs and deliver benefits to the people. It is only normal that China and the US differ on some issues due to historical and cultural reasons. We must strengthen dialogue and communication, enhance mutual trust, properly handle differences and sensitive issues, and move forward Sino-US relations on a right track. Second, we must strengthen cooperation and achieve win-win results. We must continue to have innovate thinking, tap potentials for cooperation, and further strengthen mutually beneficial cooperation in the fields of trade, investment, science and technology, energy and infrastructure. Leo Melamed, Chairman Emeritus of the Chicago Mercantile Exchange told me that China will remain as America’s economic partner for the next 10, 20, 50, 100 years or even longer. I fully agree with him. Sino-US economic and trade cooperation helps China integrate into globalization to a certain degree, and the Chinese industries and businesses have learned a lot from the United States. At the same time, this cooperation is also helpful to the United States. According to the US-China Business Council report, Sino-US bilateral trade and two-way investment in 2015 helped the United States create about 2.6 million jobs and made a contribution to the US economic growth that was equal to 1.2% of the US GDP. Bilateral trade has significantly reduced the average price of Chinese exports to the United States, saving $ 850 a year for each American family. According to the US Export to China (2006-2015) published by the US-China Business Council, the US export to China in the past decade grew faster than its export to other countries. In particular, the US export of goods to China increased by 115%, higher than that to other 10 major trading partners. The US export of services to China increased by 300%, while its export to other countries only grew by 91%. China’s consuming market boasts huge potentials as China’s economy keeps moving upward and people’s purchasing power increases. The US export to China will grow significantly, rising to $ 520 billion in 2050 as predicted in the report. It is worth mentioning that the US-China trade in service boasts great potentials that shall not be overlooked. The US has the most advanced modern trade in service, and is the most competitive exporter of services that are capital intensive, technology intensive and with high value added. With the Chinese government opening its service industry wider to the world, we believe that the US trade with China in service is sure to rise significantly in the near future. Deputy Director Ed Dieter of the Minnesota Trade Office told me that Minnesota’s export of goods to China increased by 136% from 2006 to 2015, while export to other trading partners only grew by 18%. Minnesota’s export of services to China increased by 291%, while export to other countries only grew by 52%. Minnesota’s trade deficit with China has been decreasing. According to statistics released by the Chinese Ministry of Commerce , the US investment in China last year increased by 55.4% year-on-year. As a developing country, China is making remarkable progress in terms of opening its market at an incredible speed and scope. China has become one of the openest developing economies. China is committed to opening wider to the world, and welcomes countries, including the United States, to invest in China, and will continue to provide more investment opportunities for foreign-funded enterprises and create a better investment environment. Last October, the US-China Business Council released a report on China’s business environment, indicating that nearly three quarters of the interviewed US companies are optimistic of China’s economic prospects, 90% of them have gained profits in the Chinese market and nearly half of them are planning to expand investment in China. We welcome this. At the same time, we also hope that the United States can open its door to Chinese investors, so that mutual investment and trade cooperation can develop in a more equitable, transparent and open environment. The exchange rate of RMB against US dollar has been raising in the past few years. The recent RMB exchange rate against US dollar has decreased due to the latter’s appreciation against all major currencies. China’s economic development does not support devaluation of the RMB, and China has no intention to boost its export edge by devaluing the RMB. Recently, the media is speculating the possibility of a Sino-US trade war. I think trade war does not meet the interests of both countries, and no one will emerge as a winner from it. Earlier this year, Chicago Tribune published an editorial, saying that the lost jobs in America’s manufacturing in the last 30 years did not go to China and Mexico, but was only a natural result of increased productivity caused by automation. US factories are becoming more advanced with higher production, yet with fewer employees. I can also share some other figures and stories with you on China-US win-win cooperation in the nine states covered by our consulate in Chicago. In 2015, trade volume between China and the 9 states reached 92.6 billion US dollars, bringing more quality products in the Midwest into the Chinese market and also more fine Chinese products to American consumers at a low price. Chinese enterprises have invested nearly 13 billion US dollars in these states, creating nearly 30,000 new jobs. For example, Wanxiang America Corporation based in Elgin, Illinois has investment projects in over 20 American states with a total investment of 10 billion US dollars, creating 8,000 new jobs. After the acquisition of Michigan’s Nexteer Automotive by China’s Automobile Industry Holding Co. Ltd. (AUIC), the number of employees increased from 3000 in 2010 to 5000, making an important contribution to the economic development and employment of Michigan. Last year, a subordinate company of China Railway Rolling Corporation (CRRC) won a bid for Chicago subway project with 846 vehicles worth of $ 1.3 billion. This is expected to propel development and employment in supporting industries in southern Chicago. There are vast opportunities of cooperation for China and the US as the new US government intends to carry out infrastructure construction. Thirdly, we must continue to consolidate the basis of cultural communication and consolidate the friendship and deepen mutual understanding between the two peoples by expanding tourism, education, cultural and artistic exchanges. Sound relations between countries depend on the amicable ties between their people. As President Xi Jinping said in the White House when visiting the US in 2015, friendship is a big deal. We should strive to deepen the mutual understanding and close ties between our people. During his first visit to Iowa in 1985, President Xi Jinping was deeply impressed by the sincerity and passion of local Americans. Governor Sam Brownback of Kansas told me that people in America’s Midwest have lots in common with the Chinese people as they are all honest, hard-working and set great store by family values. Last September, I attended two concerts of the famous Chinese pianist Lang Lang in Champaign County of Illinois and Carmel, Indiana. By the end of the show, I saw the audience all stood up applauding Lang Lang's wonderful performance, which gave me a deep impression that people from the two countries all cherish the beauty of art. It is everyone’s hope that we can have more beautiful nights like this for Sino-US relationship. In 2016, the Chicago Field Museum held the exhibition of Terracotta Warriors and Horses. The glamour of this exhibition has attracted numerous visitors and increased the total number of visitors to the Field Museum all-year round to 2.5 million. Visitors who are interested in the splendid ancient culture of China grew by 500,000 compared with previous year. I also visited the Nelson-Atkins Museum of Art in Kansas City, the Art Institute of Chicago and the Detroit Institute of Arts, who all hope to cooperate with China on the exchange of art exhibitions. Chicago City's "Happy Spring Festival" celebration has become a well-known brand of cultural exchanges between China and the United States. The launching ceremony of this year’s celebration was held in the cultural hall of Chicago in early February, where 600 people gathered around to cheer for the fantastic Chinese shows and performances. During the Chinese Spring Festival this year, several art troupes from China came to the Midwest to celebrate the Chinese New Year with local Chinese people and American friends. They were warmly welcomed by the local people all along their trip, and their performances included fabulous dances and breath-taking acrobatics. The audiences were truly amazed by their performances. Some people told me that they didn’t blink so as not to miss a single second of the performance, hoping that the Chinese artists could come again as their performance was so breath-takingly beautiful. After watching a show called The Legend in Chicago, Nobel Prize winner Professor Stoddart said to me that he would not sleep that night so that he could use the whole night to recollect the spectacular performance. Former US Treasury Secretary Henry Paulson said that the performance was a truly magnificent celebration of Chinese cultural traditions. Cultural and people-to-people exchanges between China and the US will play a significant role in the future development of bilateral relations, and the performance will help people from the two countries to understand and be grateful to each other. The total number of Chinese students in the nine states covered by the Consulate General in Chicago has reached 80,000, and they have served as a bridge for youth communication between China and the US. The number of American students studying Chinese at 19 Confucius Institutes in the nine states is also increasing. During my visit to Minnesota, I talked with students who study Chinese at local schools and their parents and learned that all courses from grade 1 to 10 were taught in Chinese. They can all speak very good Chinese. There are a lot of people who are now applying to enroll in schools, but there are hardly any places. Many American families want their children to have a China-related job in the future, and this trend is gaining more momentum. We hope that Sino-US cultural exchanges can achieve greater development. Fourth, China and the US should strengthen communication and coordination, strengthen cooperation in such areas as the Korean Peninsula nuclear issue , Afghanistan issue, Syrian issue, anti-terrorism, non-proliferation, and fight against transnational crimes, promote global economic governance and jointly safeguard world peace and stability. The DPRK nuclear issue has been put under the spotlight recently. Many believe that China can impose greater pressure on the DPRK and play a bigger role. I would like to point out that China has been committed to realizing the denuclearization of the Korean Peninsula, upholding peace and stability of the Korean Peninsula and solving the problem through dialogue and consultation. Denuclearization, and no war or chaos are China’s red line. Nuclear weapons on the Korean Peninsula are not in the interest of various parties nor helpful to the DPRK’s safety. Any chaos on the Peninsula will inflict unimaginable consequence. We should earnestly implement UN Security Council resolutions 2270 and 2321 and take further effective measures to curb the DPRK’s nuclear development program. At the same time, we should stay committed to resolving the issue through diplomatic negotiation and dialogue , which is the fundamental way our of this issue. The resolving of the Iranian nuclear issue has offered us a good precedent, and the negotiation of the Iranian nuclear issue also borrows good practices from the Six-Party Talks. What is pressing now is to restart the Six-party Talks as soon as possible. During the period from 2003 to 2009 when the Six Party Talks ran well, the DPRK nuclear program was put under effective control. Then the talks were suspended for eight years, during which the DPRK conducted one nuclear test after another. The crux of the Korean nuclear issue is the conflict between the US and the DPRK, who are parties directly concerned. They should make quick political decisions and engage in dialogue to improve their relations. China is willing to play our positive role in this effort. Respecting each other’s core interests and concerns is a critical foundation for China and the US to cooperate on the Korean nuclear issue. We hope that the US can take China’s concerns on the THAAD system seriously and stop the employment of this system in the ROK. At present, the world economy is still facing uncertainties, and economic growth remains sluggish. China and the United States should strengthen macroeconomic policy dialogue, respond to the international financial crisis in a constructive and united way, and make an important contribution to global economic recovery and growth. Practice shows that China and the United States have forged a rather mature cooperation mode in a number of areas of global governance. The world's general expectation is that China and the United States play a constructive role in promoting economic growth in the world today, solving global problems, regional conflicts and hot-spot issues, and bringing benefits to the world. I would also like to say a few words about the South China Sea issue. China has indisputable sovereignty over the Nansha Islands and its adjacent waters, and China’s claims are based on solid historical and legal grounds. While firmly upholding its territorial sovereignty and maritime rights and interests in the South China Sea, China is committed to peacefully resolving disputes over the South China Sea through negotiations with parties directly concerned. China firmly upholds the freedom of navigation enjoyed by all countries under international law and resolutely upholds peace and stability in the South China Sea. With the joint efforts of China and the relevant ASEAN countries, the current situation in the South China Sea has been eased. China and ASEAN countries have reached an important consensus, or the "dual-track" solution, which means that disputes shall be resolved by parties directly concerned through bilateral negotiation, and China and ASEAN countries shall work in unison to uphold peace and stability of the South China Sea. Non-regional countries should be happy to see such a good situation and sound momentum, and also play an active and constructive role in upholding and promoting regional peace and stability. Born out of the victory of the Second World War, the Cairo Declaration and the Potsdam Proclamation clearly stipulate that Japan must return the stolen Chinese territory to China, including the Nansha Islands. It is with the help of then American government that the Chinese government at that time recovered the Nansha Islands illegally occupied by Japan and restored sovereignty in 1946. Later, some neighboring countries illegally occupied some islands and reefs of the Nansha Islands, which led to the so-called South China Sea dispute as we speak now. China has always been committed to peacefully resolving the dispute through dialogue and consultation with parties directly concerned based on historical facts and international law. This position will not change in the future. Given that the South China Sea issue has been returned to the right track of negotiation and consultation between parties directly concerned, countries outside this region should support the efforts by regional countries to maintain peace and stability in the South China Sea. Therefore we attach great importance to remarks by the new US Defense Minister Matisse on resolving the South China Sea dispute through diplomatic efforts. This is not only the established position of China and ASEAN countries, but should also be the right choice of non-regional countries. The United States is not a party to the dispute in the South China Sea. We hope that the United States will respect the historical facts and abide by the principle of not taking side on the sovereignty issue in the South China Sea. The US should not link this issue to China-US strategic competition, as what China does in the South China Sea is only to defend its own territorial sovereignty and maritime rights and interests. The Gateway Arch in St. Louis is a symbol of how Americans blazed new trails through brambles and forged ahead. It has been an inspiration to the brave for half a century. Under the new circumstances, Sino-US relationship should build upon the past good practices and make new headway through joint efforts so that it can stand the test of time. As President Xi Jinping and President Trump talked on the phone, the development of China and the United States can fully complement and reinforce each other, and the two sides can fully become good partners of cooperation. We hold our hopes and expectations high for this! · We are on Twitter and Facebook now!